2018 FINAL RESULTS ARE POSTED! You do not need to submit your scores. Scores will be collected and calculated from a USDF data feed. and will be automatically entered for year end awards, unless you choose to opt out of them (see below). * Rider & Owner/Lessee information used will be what is listed with USDF. Please make sure USDF records are up to date with the current information on you and your horse. at USEF/USDF recognized competitions, you need to register the horse, listing yourself as the lessee. You also need to complete the USDF Lease Recording Form and pay the $25 Lease Recording Fee. must provide a copy of their USEF Amateur card if their status is not listed with USDF. Results will be posted up through 15 places for each category. If you do NOT wish to participate in the NEDA Year End Awards, you may opt OUT of them. Silent auction to benefit the NEDA awards program! Taking place at the NEDA Year End Banquet on November 17, 2018. We are looking for donations of items to make your award program better then ever! Nothing is too big or small and everything in between. Can be horse related or not. Some examples would be a whip and saddle pad, to a one night stay in a rental house, to baseball tickets and more! We would love to make this a great success but we need your help! Please contact Cara Kettenbach with donations or questions at nedabanquetsa@gmail.com or 978-360-7158. 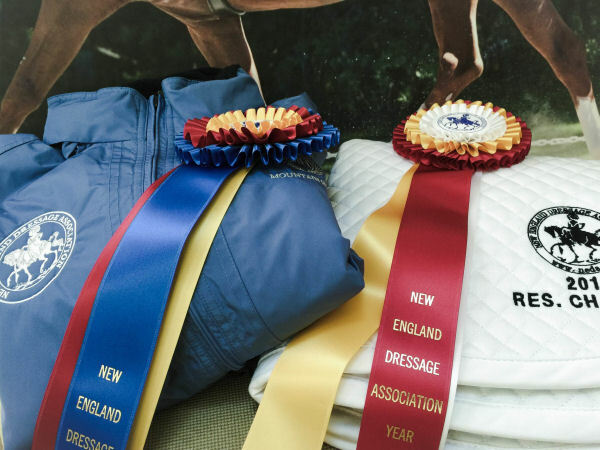 For the 18th year, Mountain Horse is the official sponsor of the NEDA year end awards!